How's everyone doing ? I hope you all had a good Christmas and are ready for the New Year and have fun with whatever celebrations you may have planned. Our new challenge will be announced tomorrow along with our Blog Hop and we hope you will all be joining in the fun, but before we get to that here are this months winners. Well done Sarah, please mail me brenda@ibas.co.uk with your postal addy so you prize can be posted off to you as soon as the postal service gets back into operation after the weather and seasonal delays. Congratulations all of you, please all help yourself to our Top 3 logo. Hello folks, don't worry and think you have a lost a couple of weeks because this post has appeared, you still have nearly two weeks to get ready for Christmas, honest.....and enter this months theme for a chance to win the great prize on offer. I am just popping in to tell you about our special plans for January...............when our new challenge goes live on 1st January we are also having a blog hop. We thought it would be the perfect start to the New Year and as you would expect there will be lost of prizes on offer so we hope you will all be joining in the fun. Please grab the logo above and help us spread the word and look forward to seeing you all on 1st January. Hello everyone, are you nearly ready for Christmas ? Last month was a real bumper one and I want to say a huge welcome to those of you who joined us for the first time and of course a warm welcome back to our regular players. If the number of fabulous entries we had last month are anything to go by, then most of you have plenty of Christmas cards ready for the post so we thought something completely different will be just what we are all looking for after the seasonal crafty excesses of the last few weeks. I'm going to be a real tease here and tell you that next month is going to be very special here at Stampalot Challenge, but that's all I am saying for now other than we have a great treat in store to kick start the new year. As usual, you can make anything you like as long as you follow the theme and challenge rules......these are listed on the sidebar so please do check them out before you link your entry. Last but not least, some inspiration to set you on your way. As usual the DT have come up up with some fabulous work and you can go visit each of them by clicking on their names. Evening peeps from a really cold Cambridgeshire. The snow is throwing it down outside and there are high hopes floating about that school will be off tomorrow. I wonder ? I'm a little early posting this months winners because I want to tell you all about a super duper day this coming Saturday at Sir Stampalot........it's the the third Ultimate Rubber Stamping Day......seven live and totally different demonstrations running simultaneously throughout the day, free refreshments, free prize draw, loads of sample cards and inspiration and of course a shop full of all that's best in craftiness. Doors open at 10am through 4pm and if the last two years are anything to go by it's a day not to be missed. Myself and the rest of the Stampalot posse are looking forwarding to welcoming both old and new faces. Check our the Sir Stampalot website for more information and your invitation to this not to be missed event..................but don't worry if you come without the invitation, everyone is still welcome. Please mail me brenda@ibas.co.uk with your full postal addy Jocelyn, so I can arrange for your prize to be posted to you. And well done to our three runners up who can all help themselves to our Top 3 logo. Sorry to pop up on your dashboard again so quickly this month, but can I please remind you all to check our rules before you enter your work. 1) Your entry to Stampalot challenge can be combined with up to five other challenges, so a maximum of six challenges in total. 2) If we find you have added more challenges to your entry at a later date.....sadly some folks do........and yes we do check as we all visit a second time when we do our winners selections, then your entry will be discounted. 3) You must mention our challenge in your post along with a direct link back to this blog. 4) In line with most challenges our rules do not allow backlinking.....this means your entry must be posted/dated the day you enter our challenge. **********Up till now I have always tried to mail peeps or leave a polite message to remind them if they do not meet the rules but this takes a lot of time when myself and the DT could be visiting other entrants. Stampalot Design team all work very hard to make this challenge fun to enter and ensure all entrants receive comments from us. 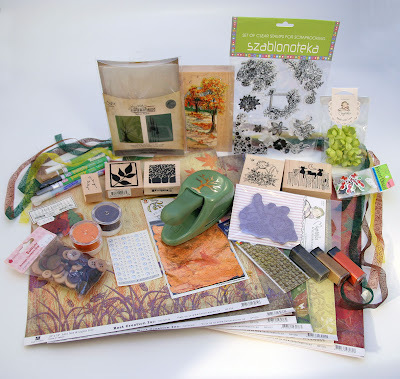 Plus the prizes on offer from the guys at Stampalot are always rather special. So let your imagination run riot and show us what you will be sending out to friends and family this Christmastime. It could be a beautiful Christmas tree, a wintry landscape, Father Christmas and the presents, or an elegant seasonal sentiment taking centre stage on your work, it really is down to you and your interpretation of the theme. 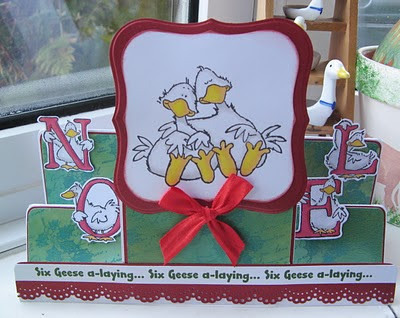 As always you can enter a card, l/o or just about anything, all we ask is that it is your own original work and we are really looking forward to visiting you and seeing all your creations. 1)Please remember you may combine your entry with other challenges, but up to a maximum of six challenges in total including Stampalot. We have noticed that a few naughty peeps have even added more entries after entering our challenge. 2) You must mention our challenge in your post along with a direct link back to this blog. Edited 2nd November - in line with most challenges our rules also stipulate no backlinking, we have already had to delete some this month and we are only one day in !! Lorraine is poorly and unable to join us this month. We all wish you a speedy recovery Lorraine, look after yourself and see you when you are well again. Hello everyone, time to tell you who this months lucky winners are. Some lovely work again and a big thank you to everyone who joined in, although we did wonder if some peeps were not too keen on the theme, but hopefully what we have on offer next month will appeal to just about everyone. Please mail me brenda@ibas.co.uk with your full postal addy Sandra. 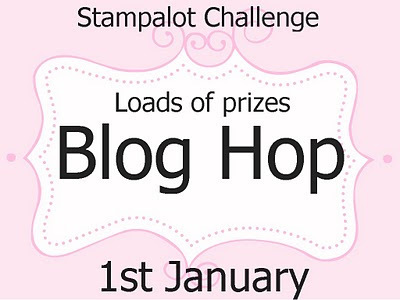 Don't forget to check back Monday for our new challenge and another fabulous prize from Sir Stampalot. Good Morning everyone out there in blogland. 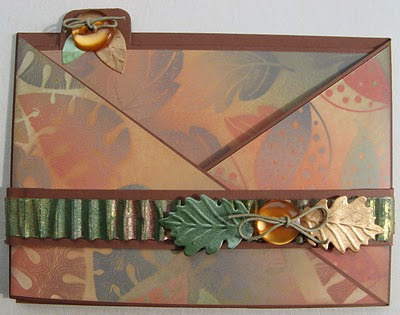 I know I don't normally pop up in the middle of the month, but a few peeps have contacted me about this months challenge as it seems the theme has confused some of you a bit and especially the "Autumn Breezes" part. So I thought I ought to do a post to clarify a few things. Basically all we are looking for are projects that are Autumnal, you know leaves or trees or images coloured in Autumnal colours or even just DP's with those colours. Your choice completely, the only real requirement is a button and a bow, or more of course. We had another bumper month in September with more wonderful entries, you seem to raise the bar every month and keep showing us what a talented bunch you are out there. I know I'm a real bore, but I so love the beautiful vibrant colours of Autumn. I realise there have already been a few challenges with this theme lately, but I just know from looking around blogland that it's a theme so many of you enjoy and myself and the Design Team are itching to be let loose on your blogs and see what you pull out of the hat. I think I was crafting in one form or another from the pram and I have been Papercrafting for more years than I care to remember, looking back my sister and I used to cut out pictures from the 1950s clothes catalogue and the womens weekly, and glue them onto a cardboard box with flour and water paste, and when they were completetly dry paint them with a coat of coloured furniture varnish which gave them an antique look. 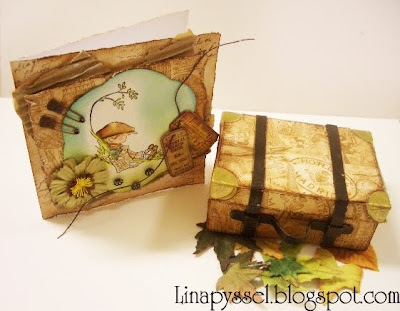 "Our treasure boxes" we called them and what I first knew as decoupage. 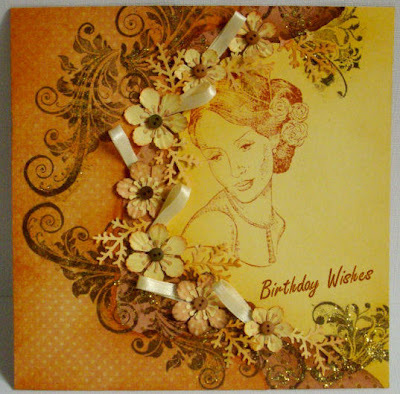 I started doing it seriously when I saw a picture of a card which had hand made paper flowers made from punches and I thought how beautiful and from then on I was hooked and it is still my favourite medium for any project. 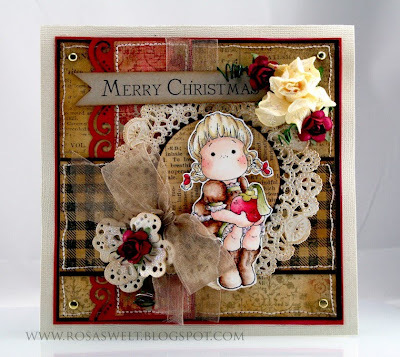 I have since progressed to stamping and all sorts of colouring mediums. Although I do love the distressed look, I somehow manage to get ink everywhere..... so these projects are few. 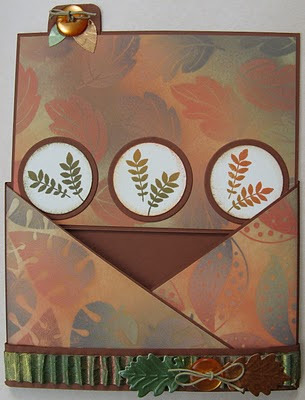 I learn something new everyday from fellow crafters, and I thank all crafters for sharing all their knolwedge. Without them non of us would progress. And here is some inspiration from the Design Team who have really pulled all the stops out this month with an absolute feast of all things Autumnal. If you click on their names you can visit their own blogs and see how they made their projects.